AmazonA phone displaying a lockscreen advert from Amazon. 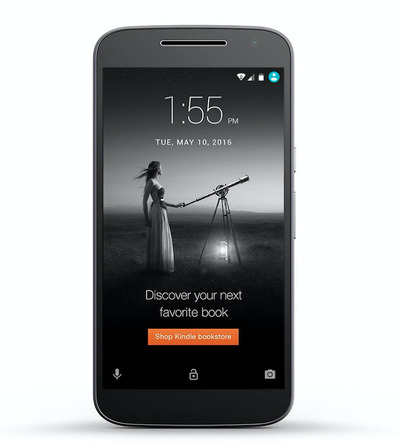 Amazon has a plan to sell you cheaper smartphones: Load them up with adverts. The online retail giant announced Wednesday that it is going to start selling certain Android phones to people pay for its Prime subscription service for up to 50% less than the regular retail price. The catch is that the devices will come pre-loaded with apps, and adverts will automatically appear on the lockscreen. For now, two devices are included in the offer, Amazon said in a press release. These are the BLU R1 HD, which is selling for $49.99 (it normally retails for $99.99), and the Motorola Moto G fourth-gen for $149.99 (normally $199.99). The devices will come unlocked, and there’s no word on when the scheme will launch outside of the US. Adverts will appear in two forms on users’ lockscreens. There will be full-screen adverts replacing the regular background, as well as smaller ones and offers that will appear like notifications below the users’ other non-ad notifications. Additionally, the phones will come with pre-installed apps from Amazon, like Amazon Video and Amazon Kindle. It’s a pretty good deal — as long as you can stomach the ads.